Adidas Solar Glide are neutral cushioned running shoes. The brand new Adidas Solar Glide has the difficult task to take up successful Supernova Glide 9 and not only face direct strong competitors like popular Nike Air Zoom Pegasus 35 but also its bigger sibling within Solar lineup, the premium Solar Boost. 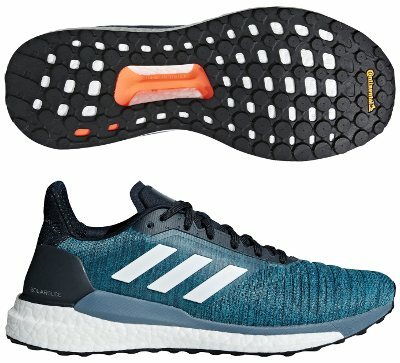 Although similar at first look and targeting same end users (neutral runners looking for more cushioning than response), the Solar Boost is one step above Solar Glide because of more sophisticated upper (including recycled plastic for improved fit, "Tailored Fibre Placement") and beyond standard Torsion® system for enhanced stability, something that gets reflected in higher price as well. Changing official brand name from its predecessor Supernova Glide 9 has more to do with marketing than with real changes because current Solar Glide continues most of the well known features with some improvements. Upper is based in knit-like mesh which adapts well and allows enough ventilation for great breathability. Although upper looks very clean, there are a coupleof fused panels that embrace midfoot for secure fit while several transversal reinforcements in forefoot promote flexibility for quicker toe-off. Rear area keeps solution premiered in popular Ultra Boost with FitCounter™ for increased stability around the heel and larger collar pad ("S-Curve") to provide better protection in Achilles area. Rest of Solar Glide is similar to what was unveiled in mentioned Solar Boost including overall stability improvement thanks to the combination of lateral reinforcements ("Solar Propulsion Rails") with classical Torsion® system. Although not explicitly mentioned in official naming, midsole is basically made of well-known Boost™ foam with firmer layer on top to improve response although not at the same level than its smaller sibling Adizero Boston 7. It seems Adidas has mastered its StretchWeb™ outsole concept which also features great grip even on wet surfaces thanks to outstanding rubber made in partnership with renowned tyre manufacturer Continental®.